The arrival of the 2019 Morro Bay Winter Bird Festival this January 18-21 gave me good reason to consider doing a pastel of one of my favorite ducks, the Bufflehead. A striking contrast of black and white and seen diving for the aquatic invertebrates, shrimp, crabs, amphipods, isopods, snails and mussels found in the brackish water! Lately, they’ve been bobbing on the waves and sheltering in the lee of the marshes when we have the winter rains blowing through Morro Bay. I’ve entered three pieces of artwork including this Bufflehead pastel in the “For the Birds” Exhibit at the Morro Bay Art Center. Feel free to come say “Hello” to me at the Reception on Sunday, January 13, 2-4PM. 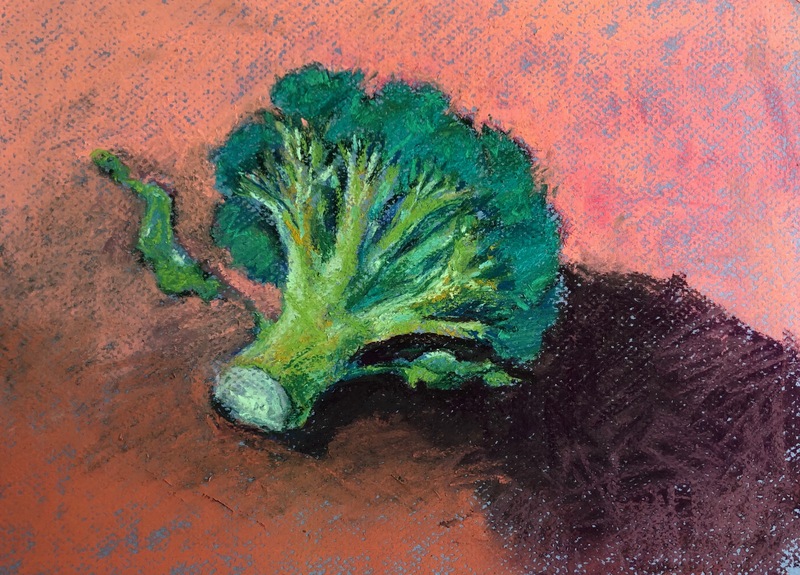 As I was growing up, my mother often put a beautiful stalk of broccoli on our dinner plates. Always so bright and green along side the wide buttered noodles and a piece of roasted chicken, I couldn’t resist. Now, I skip the chicken … too much fat and it’s an animal that I came to love after raising them for their beautiful colorful feathers. I’ve altered what I eat significantly since I having learned so much over the past seven and almost eight years now. Recently, I found a super cookbook by Cathy Fisher called Straight Up Food which includes excellent information to keep me on track for proper methods of preparation. What to include and what to omit. Actually, it is the first cookbook that I found myself reading the “Preface” and then continued on to the “Introduction”, “The Food”, “SOS-Free”, etc. She teaches at TrueNorth Health Center in Santa Rosa, California. 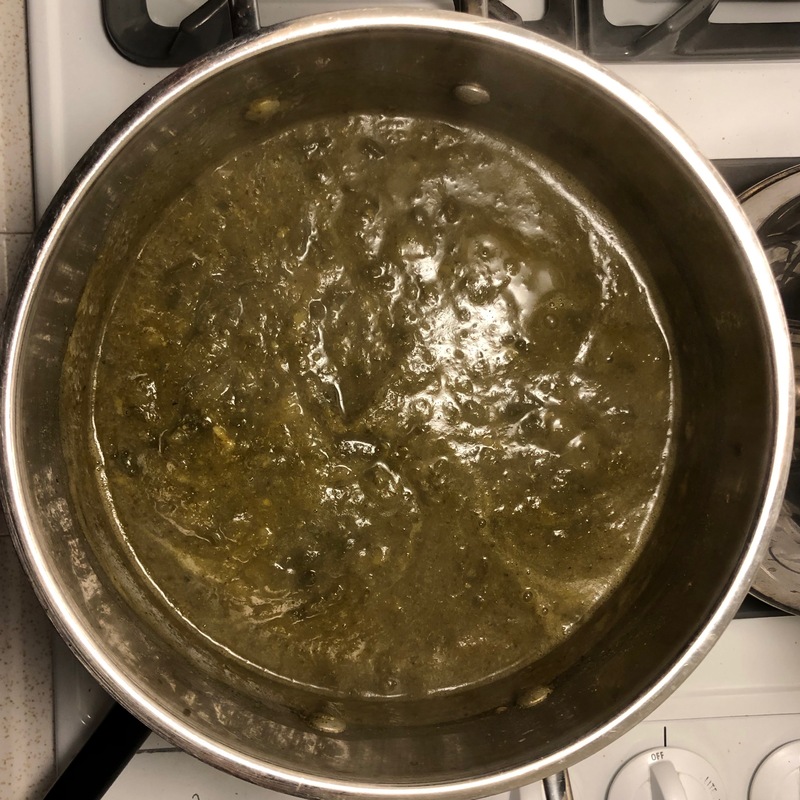 My first recipe from the cookbook was a Broccoli soup which turned a deep green because I put in a generous amount of Swiss chard. Couldn’t resist all those greens because of what I’d learned from Dr. Caldwell Esselstyn. You’ll find his books listed under “Books” and “Cookbooks.” The second recipe was called Tu-No Casserole. 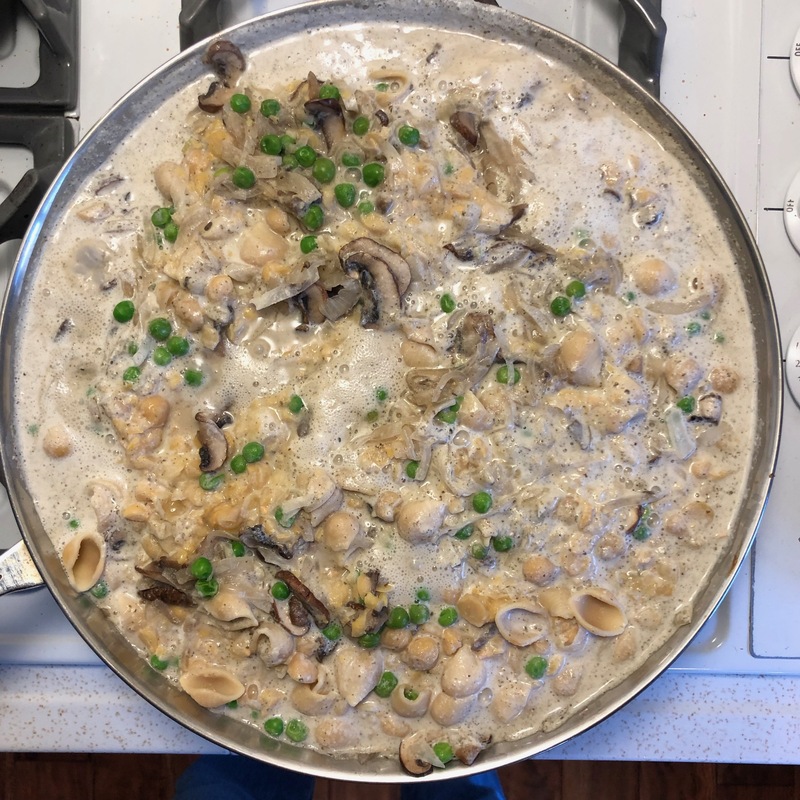 It was amusing to me, in that I’d never made a Tuna Casserole before, but since I’m from Pennsylvania and used to creamy type of foods from the Pennsylvania Dutch region. It seemed appealing. This cookbook I’ll continue to use frequently due to its creative and varied recipes along with its excellent compatibility with all the physicians, researchers and other chefs who follow a “whole foods plant based” approach to prevent and in many cases reverse the chronic aging diseases. Below is a fascinating podcast about the many benefits of broccoli. Dr. Greger also mentions the best way to get the most out of it by waiting almost an hour to cook it after cutting it up. The time increases the nutritious benefits. If you cannot do that he adds a spice. So take time to listen as you play it during your daily walk. I play many podcasts during my two mile amble around the Marina Boardwalk in Morro Bay. 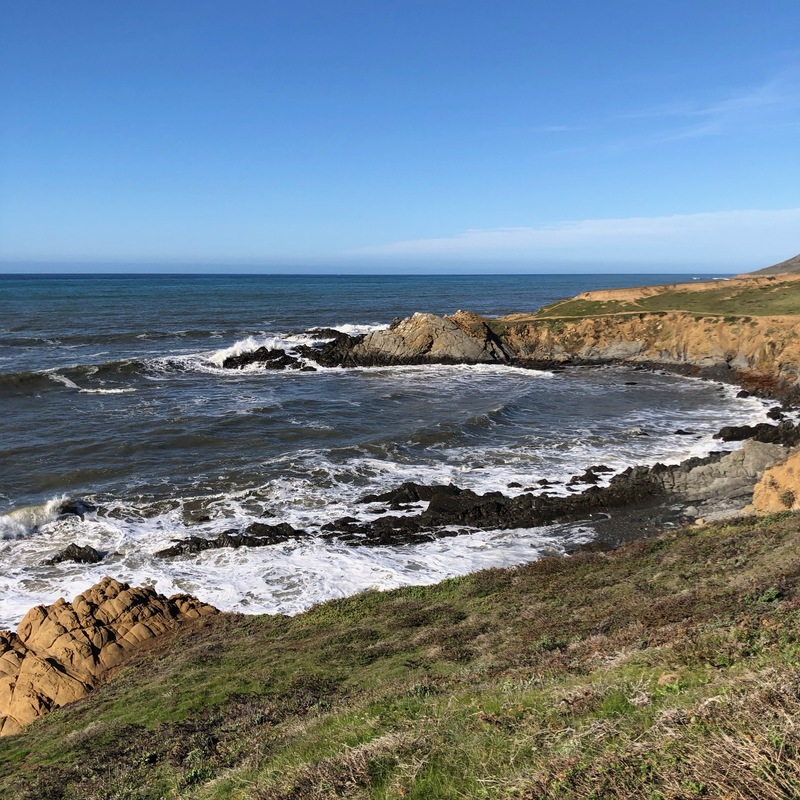 A couple days ago, the Harmony Headlands lured me out on a walk where I listened to a podcast. P.S. I love the color of fruits and vegetables and see that cooking is an art in so many ways. Either to alter the color of a soup or make a pastel drawing on a favorite fruit or vegetable. 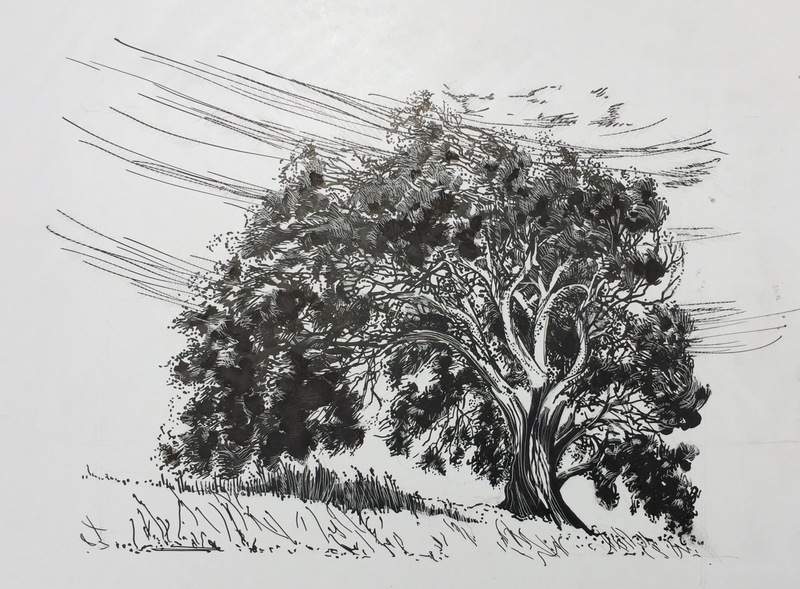 Recently, I’d gone down to visit and to wish Paula Radke success at her new gallery location at 701 Embarcadero, Morro Bay, CA. 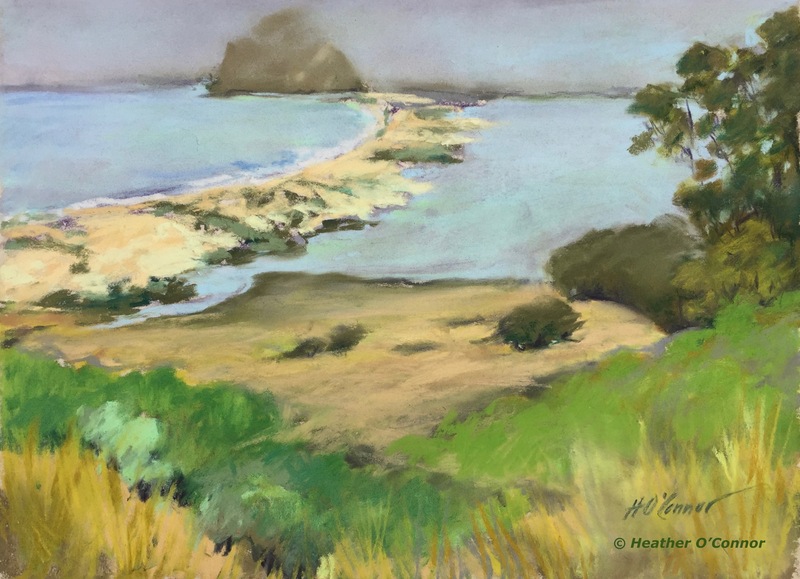 Luckily for me, she wanted to see my pastels of the Central Coast of California, so she came up to my studio and chose eleven pieces of my artwork to hang in her gallery. Also, she wanted notecards of my pastels and oils . Here are some of the pieces of my artwork that she’s showing with her Art Glass creations. She is inspired by the colorful iridescence found in beetles, butterflies, bird feathers and fish. It translates into her work in Art Glass with grace and beauty. It turns out that we both love brilliant and iridescent color! 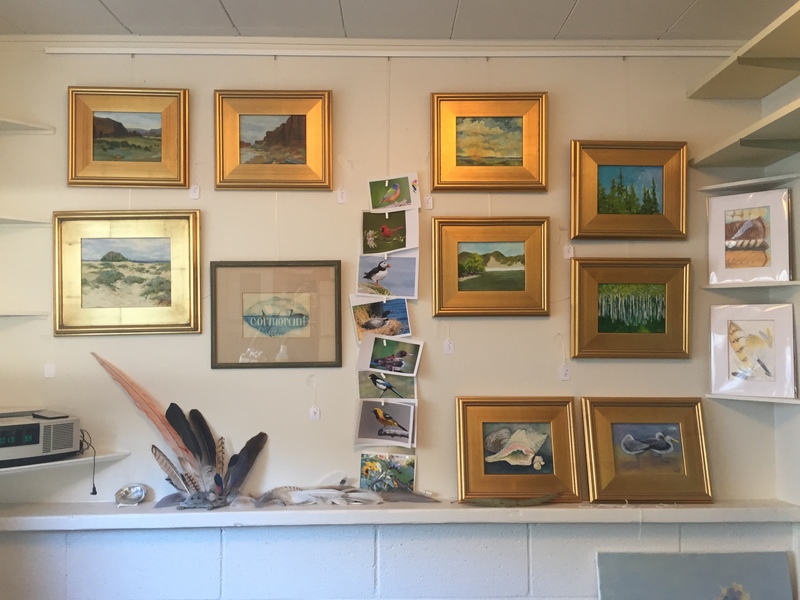 If you are waiting to have lunch or dinner at Dutchman’s Seafood House drop in to see Paula Radke’s Art Glass and my pastels and oil paintings. 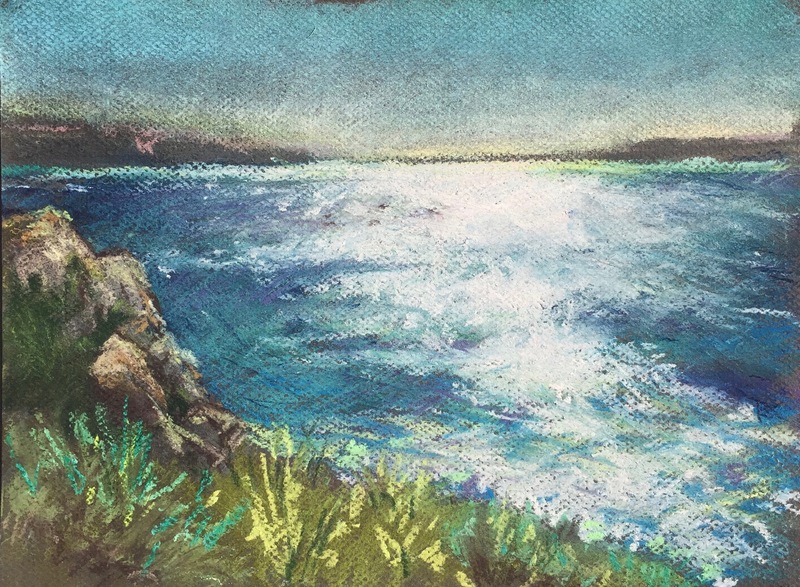 My notecards of Morro Rock and surrounding areas are available too. 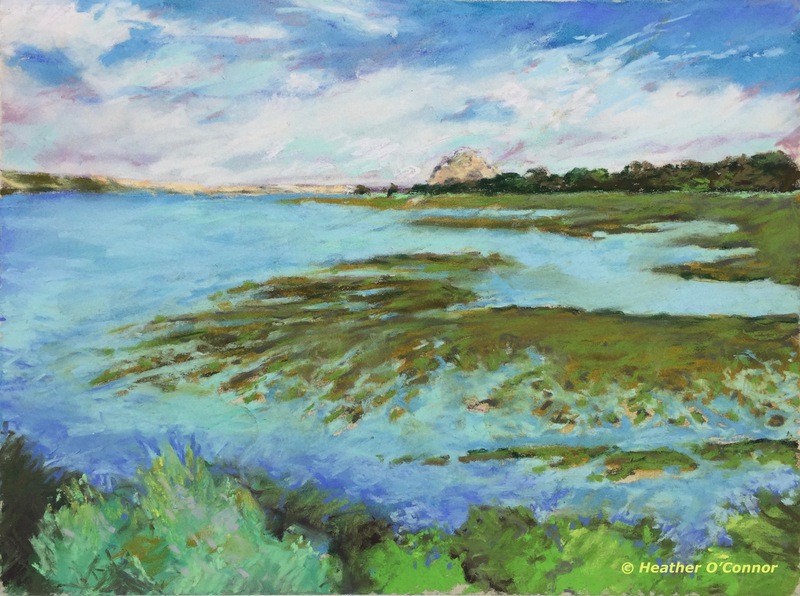 Her gallery location is near the SubSea Tours dock where whale watching is the best there is in Morro Bay, CA. It’s spring and I’m ready to show you a few more pictures! The one of the biggest fires in California’s history raged and drove towards Santa Barbara, CA and the nearby wealthy area of Montecito. 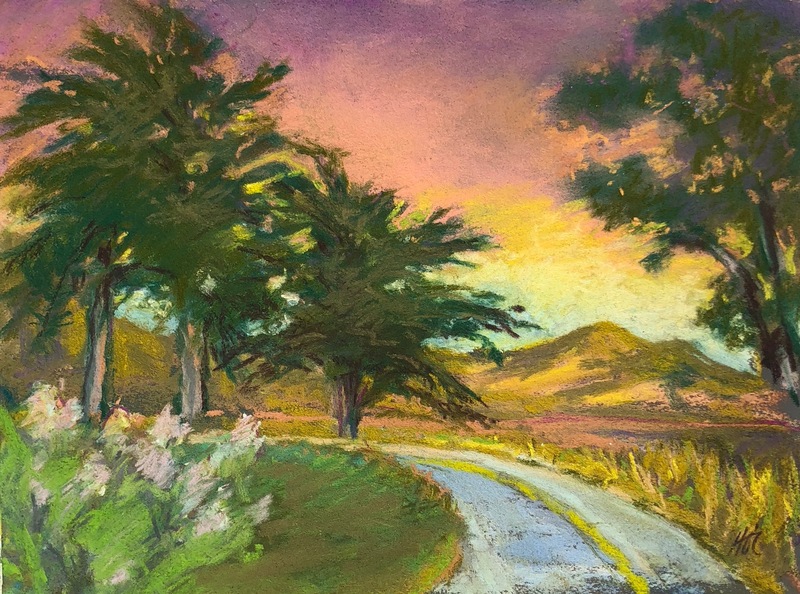 As it did, the sky over the Morro Bay State Park turned colors! 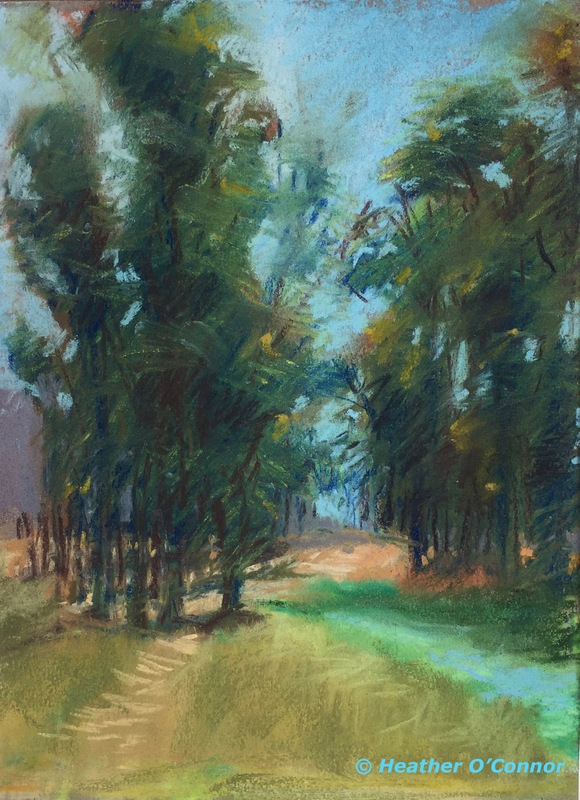 This will be in my Open Studio Tour shown along with other pastels and oils. Some a bit more calm and peaceful like this one below. 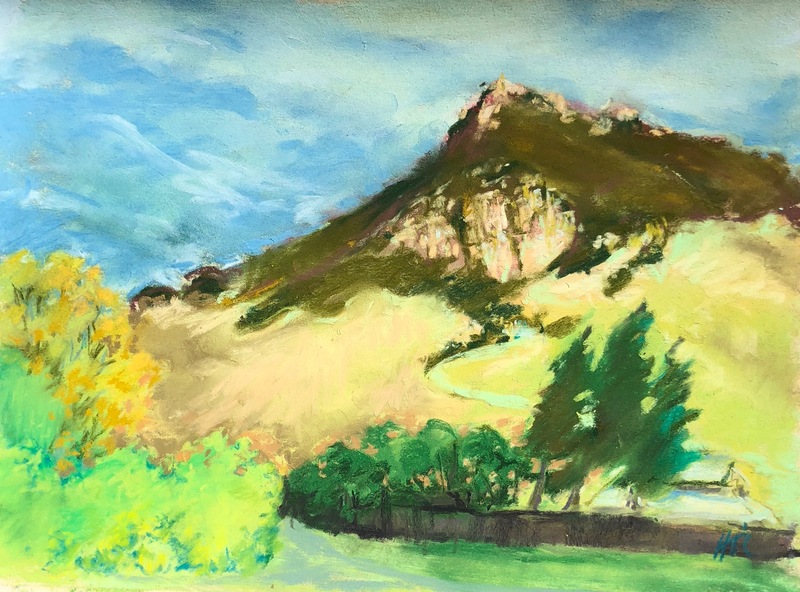 Morning light always pleases the Nine Sisters, a group of volcanic eruptions in San Luis Obispo County. I live at the most western end of one. 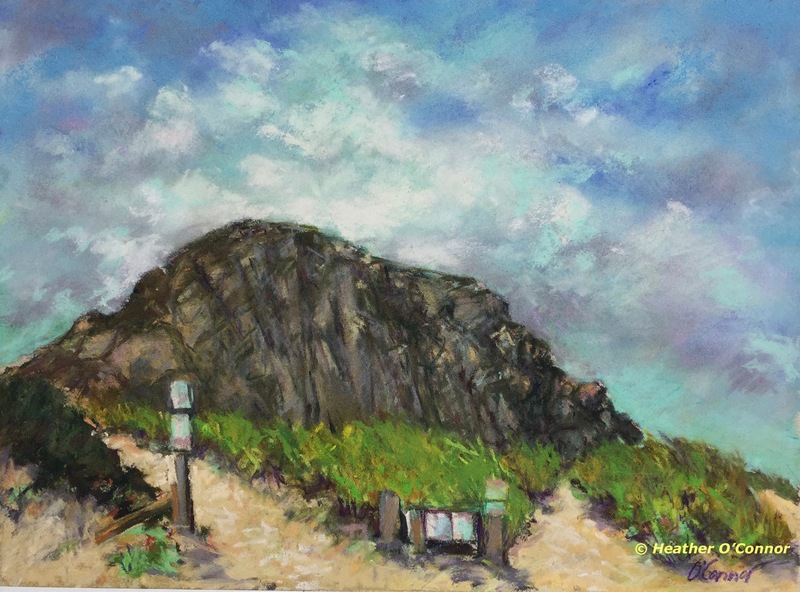 It’s Morro Bay well known for Morro Rock. 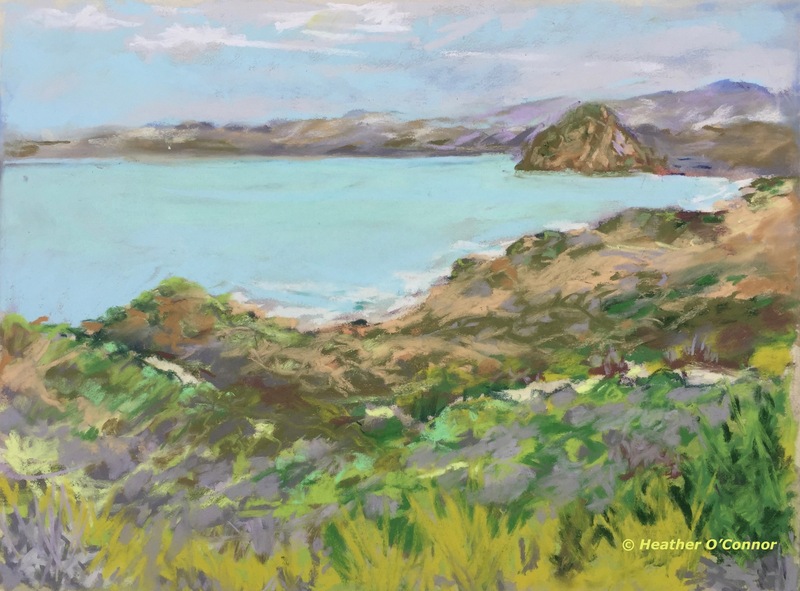 Facing the Pacific Ocean and Morro Bay, the views are always inviting me to gaze at the ever changing moody skies and brilliant colors. 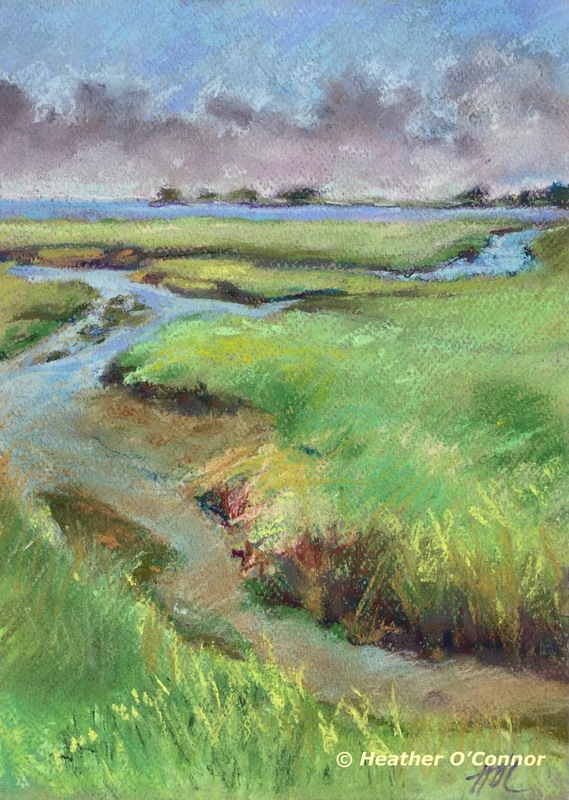 Tides rise and fall making the pickle weed marshes like chameleons. Light never is quite the same. From one of the first pull offs in Montaña de Oro, I overlooked the sand spit reaching for Morro Rock. I was high up and could look down on the native woody shrubs as late summer faded them into a golden hue. A surfers’ more northern access to the Pacific Ocean via the wide Estero Bay when looking to capture the southerly breaks… I often notice the power and weight of Morro Rock, a long eroded volcanic peak formed 23 million years ago. 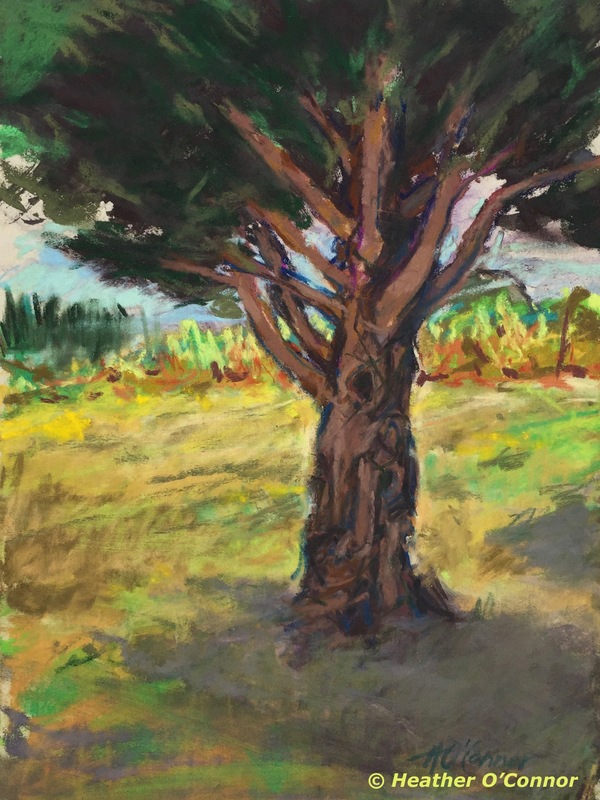 I’ve been gathering together some of my tree pastels for the San Luis Obispo 2017 Open Studios Tour. Here are just a few that are available in the “original” pastel form. They’ll be framed. Laguna Lake is a special place for birders, energetic runners, hikers, walkers and bloggers. A friend, Joyce Cory, is a keen observer at Laguna Lake. Follow the link. Also, one of my favorite eucalyptus trees is there. You may have seen it in a previous post. The Heron Rookery near the Windy Cove and Morro Bay Museum is a great viewing location for Great Blue Herons, Great and Snowy Egrets along with the ever present Cormorants. Sweet Springs is one of the best locations for birdwatching…ducks, herons, eagles, raptor, owls, etc. If you prefer the note card size, I’ll make some for you too. The idea of focusing on one tree didn’t seem that exciting. 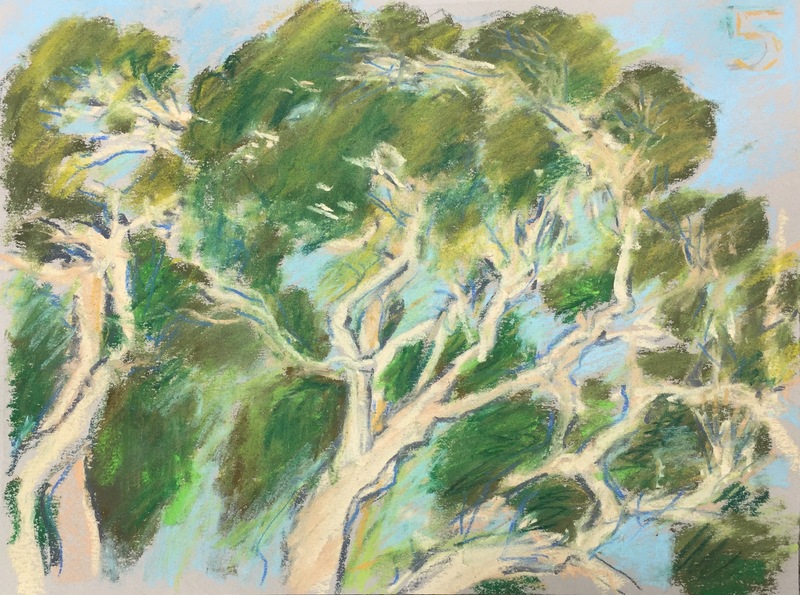 But this time, I did one pastel, then another, then a third, then a monochromatic value study, then a partial area of the eucalyptus. Different days, different light conditions, different weather, sunny, cloudy, windy, calm. All in pastel, then a black and white scratchboard and lastly the oil. I kept thinking and thinking and am still thinking there is more to get to know about this tree. 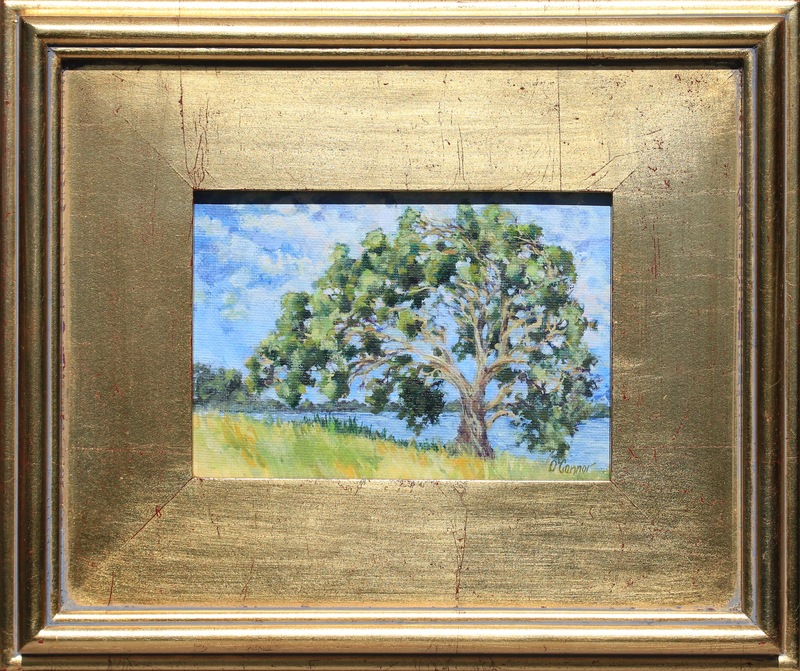 Finally, I have a little oil painting which I put in a gold plein air frame. Every time I went to see this tree, some new thought popped into my head. This is fun and not boring as I had thought it might be. It was like getting to know a new friend, each minute spent with the new friend another layer of the acquaintance expanded the personality of my new friend. 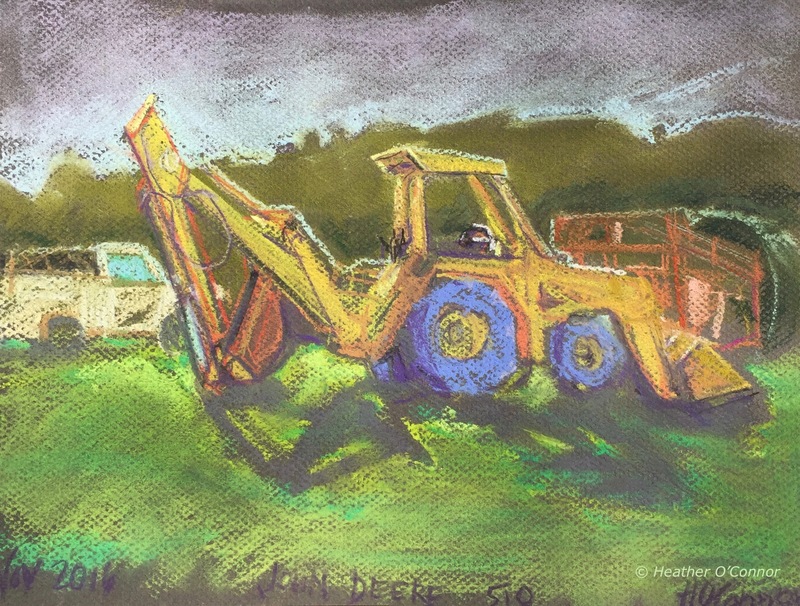 After many days doing other things*, I went to Sunny Acres*, a place where people live, farm, chop wood and grow pumpkins, to paint a John Deere 510. Sometimes machinery can have grace and charm. This one did. Then off to see the sea… a view into the glaring light at Avila Beach, CA. Then a view from the top of Black Hill in Morro Bay, one of the nine volcanic peaks forming a string of mountains going into San Luis Obispo. 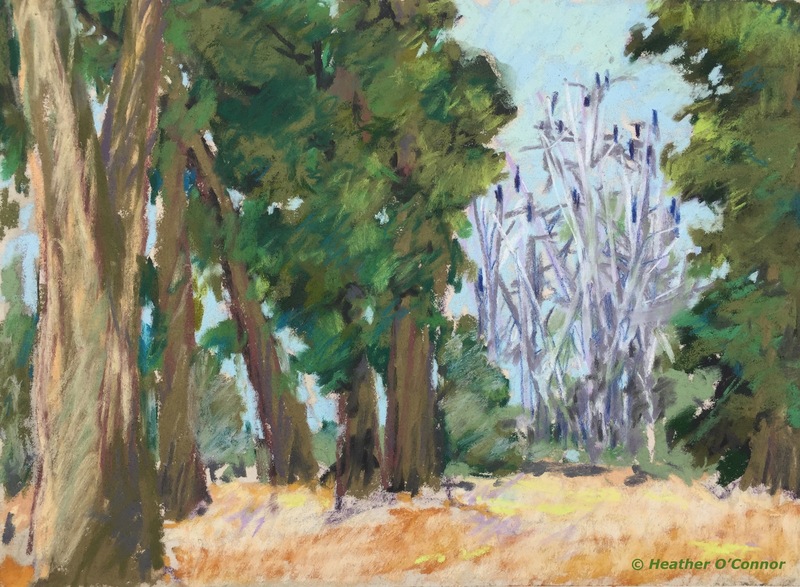 *things – Recovering from the shocking 2016 Election results and planning my focus on having lots of work to do on healthy lifestyle and healthy planet for all of us. My view is to live and vote with a 100 year perspective in mind. * Sunny Acres is a clean and sober living facility located on the beautiful Central Coast of California. It sits on a 72-acre ranch at the edge of the city limits of San Luis Obispo, CA. My first chance to participate in the Open Studios Tour turned out pretty well ! Lots of visitors including friends, neighbors, mothers with artistic children and many new people who just decided to see what I was creating. 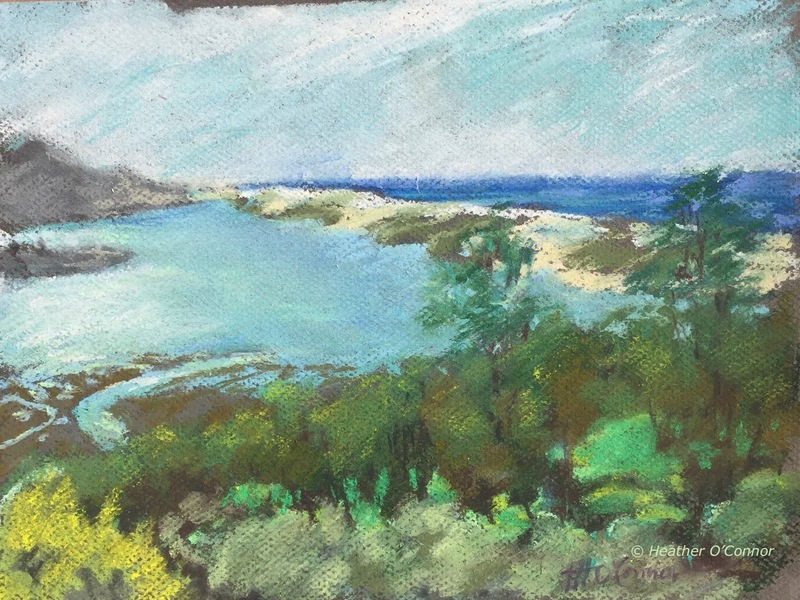 If you have the desire to see any pastels, notecards or mitered corner napkins, to purchase for holiday gifts, please contact me in the form below my signature. One of the most exciting things was that I raised $155 for the Pacific Coast Peregrine Watch on sales of mitered corner napkins, stuffed peregrine toys, peregrine pins, hats and t-shirts. 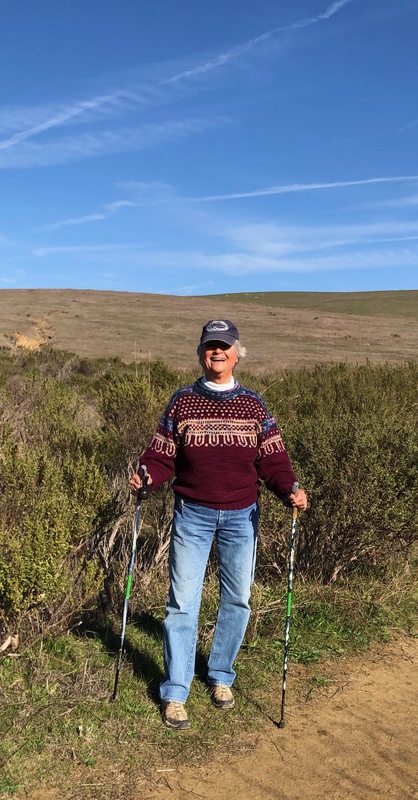 People understood that 25% of any sales I made would go to the Pacific Coast Peregrine Watch which is a 501(c)(3) educational nonprofit who gives a $1,000 scholarship to a Cal Poly Wildlife Biology student. 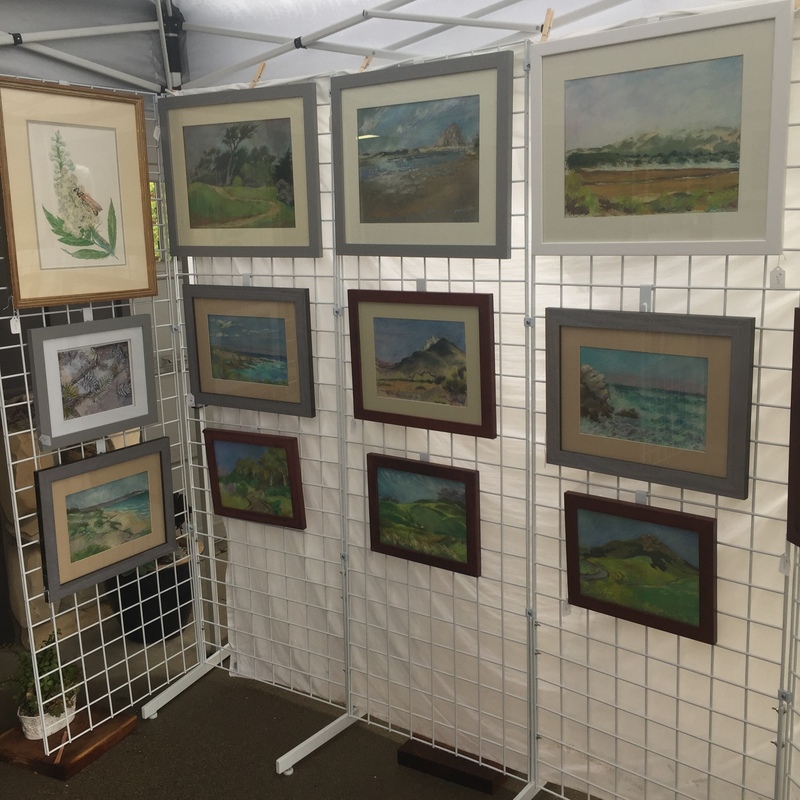 People loved my pastels of seascapes, Morro Rock, the CalPoly Arboretum and were fascinated with my birds painted on elk hide for wall hangings. 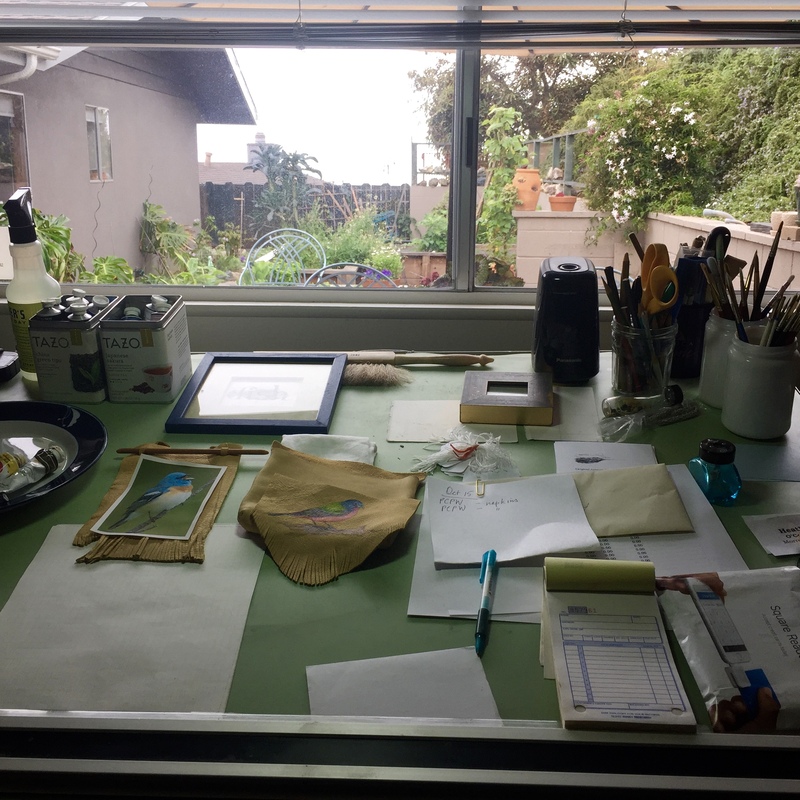 The view out of my small studio over our raised bed garden with the Pacific Ocean in the distance was a pleasant surprise to many visitors.